While you do your stuff online and view items locally, your Mac keeps traces of the activities for quicker access. However, this information may compromise your privacy. 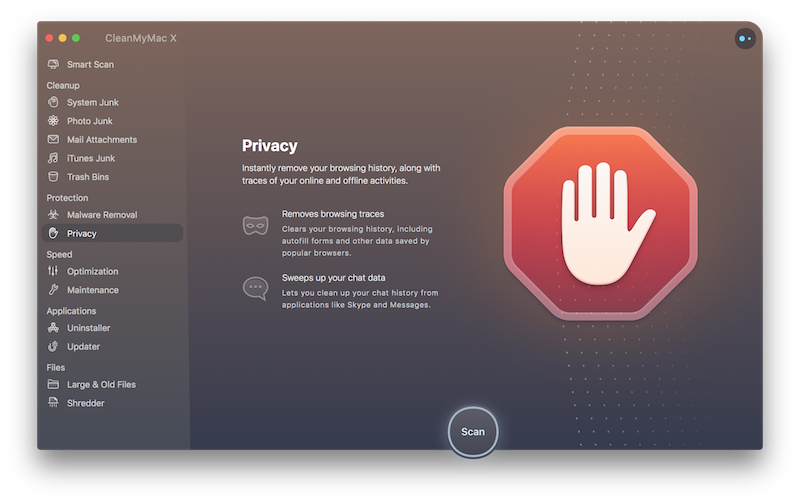 Use the Privacy module to wipe off all unwanted traces like chat history, browsing history, cookies, downloads, recent item lists, and so on. Just choose a suitable period and let CleanMyMac help you stay private. Scan: Navigate to the Privacy module and click Scan. Review summary: Look through the list of found items and make your choice. Autofill Values — data kept by your browser to quickly fill in some fields with appropriate information. Browsing History — a list of web addresses you've opened with a browser. Cookies — small files sent to your computer when you visit a website. Cookies help you navigate websites and perform some functions, but they also keep certain private information regarding your activities, browsing preferences, and history. Downloads History — a list of all files downloaded via a particular browser. Note that Privacy does not remove files themselves; it only clears a name list of these files in a browser. HTML5 Local Storage — locally stored information similar to cache. Saved Passwords — a list of credentials you allowed a browser to remember and to fill in the appropriate fields. Tabs from Last Session — a list of windows and tabs that were open the last time you used the browser. You’ll need to quit all browsers so that Privacy could detect all items with your private information. You can remove your conversation, call and file transfer history related to Skype. When you open a file with an application, it usually adds this file to its own list of recent items. Similarly, your Mac remembers all applications, documents and servers you've opened or viewed, and keeps references on them in the Recent Items menu of the main Apple menu. Your Mac keeps information about every Wi-Fi network you get connected to. In particular, it remembers the date of the connection and the name of the network you’ve used. So if you’d like to wipe these traces off, choose the unwanted records and continue with the removal. The Privacy module quickly erases all of these traces throughout the system. However, there's no need to worry about the actual files and documents, they are not affected.